Forest Watch Indonesia, abbreviated to FWI, is an independent forest monitoring network incorporating individuals and organizations committed to fostering a transparent forestry data and information management system which can ensure just and sustainable forest management. FWI believes that the vision can only be realized if forestry data and information can be fast and easily accessed and at the same time forest management is free from detrimental practices that may degrade forest’s carrying capacity and generate conflicts. Identifying and promoting policies and practices that have been proved to be able to preserve and conserve forests, and ensure justice for the local communities. Transparent . The program and the fund should be managed transparently. FWI has an independent third-party auditor audit the program and the fund use annually. The auditor’s report will be disseminated among all the network members during the National Meeting (PERNAS). Accountable . The program implementation should be easily monitored and controlled by all the members. A Supervising Team consisting of non-executive members and assuming a three years’ office is formed to monitor the program implementation. Participatory . Being a network, FWI is obliged to involve all the members both in the decision-making and the program implementation. Accordingly, any member appointed to be the Executive should therefore be proactive, i.e. creative, innovative, independent, responsive and critical to the growing issues. Professional. All the programs should be implemented professionally, i.e. punctual, scientifically accountable, productive, as well as financially efficient and effective. Accountable . The data and the information managed by FWI should be verifiable through validation. Data and information are said to be valid if the collecting mechanism has been verified, and if the sources and other attributes are clear. Any information product produced by FWI must go through internally and externally reviews. The data and the information can, however, be published without having to be validated and reviewed if they do not carry FWI’s name and logo. Equitable . The data and the information managed by FWI must be publicly accessible on condition that the use or the data sharing is clear to enable control over the use of the data and the information by the public. Barter . The data sharing managed by FWI is based on barter system, i.e. giving data and receiving data, giving data and receiving program support, and giving data and receiving fund. All the data shared are copied not master ones. Format Compatibility . The data must be arranged into a uniform format to their ensure compatibility among FWI’s members. Non-Saleability . FWI does not trade but exchanges the data and the information among the members. Node’s Independence . Each node is independent on managing their own resources, including organizing fund-raising. Partnership . FWI will develop non-binding partnership and co-operation with donors as long as it does not generate conflicts of interest with regards to FWI’s vision and mission. Prevention . To prevent conflicts of interest and to ensure that the programs undertaken support forest ecosystem preservation and justice for the local communities, FWI’s members and Nodes are not to manage fund from (a) forest/logging concessionaires (HPH/HTI); (b) mining concessionaires; (c) (large) plantation companies; (d) the World Bank* (WB); (e) the Asian Development Bank* (ADB); (f) the International Tropical Timber Organization* (ITTO); and (g) the International Monetary Fund* (IMF), as this violates FWI’s vision, mission and principles. 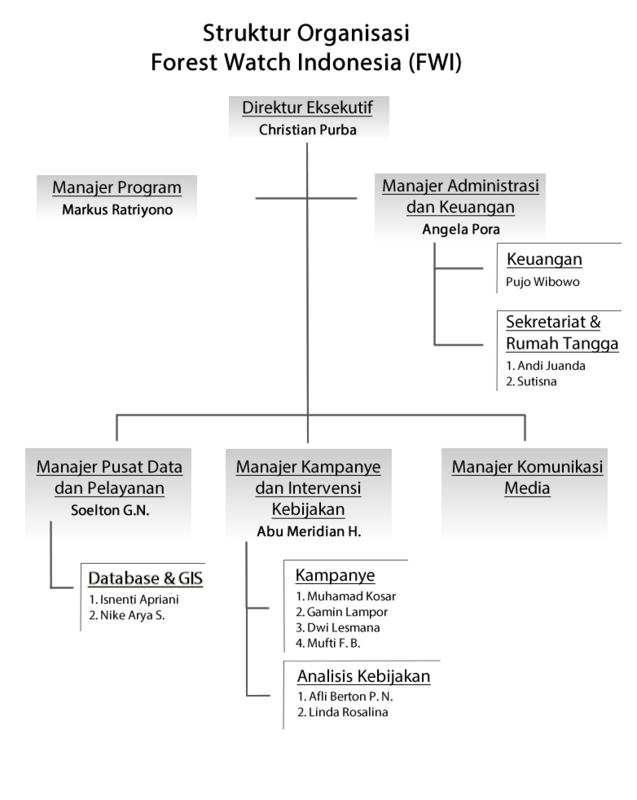 Early 1996, in the midst of conflicts over forest management, several non governmental organizations (NGO) agreed to initiate a joint program entitled Pro-Bela, coordinated by Yayasan Telapak Indonesia (www.telapak.org), to develop an independent network to monitor forest management in Indonesia. In the course of its development, the program faced difficulty in utilizing the outputs of the monitoring. A follow-up program was initiated to manage the data. FWI was founded to address the problem. FWI has a strategic role to develop transparency in forestry information for the sake of democratization of forest resource allocation and management. FWI started to work in November 1997 through a workshop attended by some 20 NGOs, followed by regional level consultations in North Sumatera, East Kalimantan and Papua, in which agreements were reached to develop FWI. Next was a national workshop in Bogor in July 1998, in which FWI established its strategy, i.e. to develop an independent data-based network to monitor forest management in Indonesia. Another workshop in March 1999 appointed Mr. Abdon Nababan coordinator, and produced the organizational structure, and made “State of the Forest Report – Indonesia” (Potret Keadaan Hutan Indonesia) its first publication target. The first FWI national meeting in August 2000 produced an agreement that FWI should have its own legal status, separated from Yayasan Telapak Indonesia, and established an ad-hoc FWI’s national secretariat to facilitate independence. The workshop also appointed Mr. Togu Manurung director, replacing Mr. Abdon Nababan. The second national meeting was held in September 2004 in Bogor, producing several important decisions, such as establishing strategic goals for the 2004 – 2007 period and revising the FWI’s organizational structure. In accordance with national meeting’s mandate, the objective of all the programs are to maintain its member’s commitment to encouraging transparency in forestry data and information in Indonesia. To this end, FWI has already set up several supporting programs, such as: a) building the technical capacity of its constituents, b) organization building, and c) use of FWI’s outputs to improve forest management and policies.